Equipment, or any physical asset in our plants and facilities, is generally expected to be efficient and effective. In other words, the equipment is expected to do what it was designed to do under defined operating conditions for specified periods of time. It doesn’t seem like we’re asking too much. Reliability-centered maintenance (RCM) focused on improving equipment maintenance with a generally accepted definition of efficiency and effectiveness. There is another broader perspective of equipment efficiency and effectiveness deserves our consideration. This concept was introduced in the 1980s with Total Productive Maintenance (TPM). When TPM hit the U.S. shores in the mid- to late-1980s, we learned that TPM was intended to develop an organization-wide work culture for improving equipment effectiveness. The five basic interdependent pillars of TPM defined the principles that made the whole process of TPM work. The basic principles of TPM coupled with the Theory of Constraints should have launched a business paradigm shift about improving equipment performance. In fact, in 1990, I was often quoted as saying, “TPM would become the predominate equipment effectiveness strategy of the 21st century.” Little did I realize the potential for TPM to be deconstructed to the point that it would be no longer be as effective a business-improvement process as intended. What changed? TPM (improving equipment effectiveness) quickly devolved to a widespread practice of “operator care.” The autonomous maintenance model for training turned into yet another spin on “operator care” as being synonymous with TPM. The TPM focused improvement principle guided by the first pillar of TPM morphed into a calculated metric of overall equipment effectiveness (OEE), which in turn launched itself into a mega-metric well beyond its intended use to compare a machine to itself over a period of time. Of the original five principles (pillars) of TPM, two were widely embraced by many implementations: operator care or autonomous maintenance and OEE percentage. Much to my dismay, this oversight served as the defeat of TPM “as the predominant equipment effectiveness strategy of the 21st century” that I predicted. Operator care and OEE do not define true TPM. However, it’s not too late to learn from TPM. Given the shortages of skilled people, the business demand for significantly improved equipment performance and reliability, and dependence on rapidly growing new technologies, true TPM will be the answer whether labeled TPM or not. Let’s consider the original premise of TPML improving equipment effectiveness by engaging the entire organization. Then, the very first pillar of TPM—improving equipment effectiveness by eliminating the six major losses—led to a growing list of the major losses or causes of poor performance. The bottom line here, at the very starting point for TPM-based improvements, is identifying the problems to be eliminated. This column will explore these two foundational principles of TPM: improving equipment effectiveness by eliminating the major losses and engaging the entire organization. It all begins and ends with these two principles. All the remaining pillars of TPM rely on these two principles. I’m going to build on the original TPM teachings of the six major losses and jump right into what I refer to as the actual equipment losses. Identifying these losses is central to improving equipment effectiveness and to getting organizational buy-in and ownership of root causes and sustainable corrective actions. The diagram below was developed for a client organization to help them recognize the metrics and measurements that must exist as a foundation for improving their bottom business performance—and to deploy plant-floor business-oriented metrics in the critical bottleneck areas. Because the plant improvement project was focused primarily on improving production flow through the manufacturing processes, it was important to understand equipment capacity. A fundamental redefinition of capacity is necessary in the plant since the concept of “equipment capacity” had been historically linked to standard production rates. Downtime was treated separately and in very general terms. Basic equipment capacity was defined as the design capacity or historical best. Capacity utilization losses occur when plant leadership makes a conscious decision not to run the equipment. Consider these losses as planned losses as shown in the diagram. Losses occurring when the equipment is scheduled to run are considered equipment utilization losses. 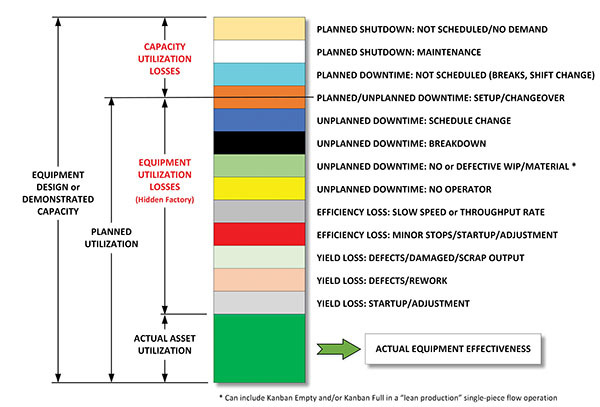 The equipment utilization losses shown in the diagram are straightforward: unplanned downtime, efficiency losses, and yield losses. However, setup/changeover losses can be planned or unplanned, as shown in the diagram. Setup/changeover losses occur as planned losses when setup/changeover actions are accomplished properly in the designated timeframe. However, when setup/changeover actions are not within the planned timeframe or are not performed properly, they should be considered as unplanned downtime losses. Although the literature is rich with standard terms for equipment-related losses, there is a significant advantage to use terms that are commonly used in the plant. The diagram shows a combination of traditional definitions used in the plant with the addition of new loss descriptions: no or defective material, no operator, and the granularity of the three yield losses. Material: All bottleneck equipment in the plant depended on material flow to the machine. Unplanned downtime should be captured whenever the material is not available or when the material is damaged or incapable of being run at acceptable rates. No operator: There have been occasions when some of the most critical equipment could not be operated because of the absence of a skilled operator. Whether because of illness, early retirement, or lack of cross training, these incidents should be logged as a type of unplanned downtime: no operator. Yield and waste: Yield losses have a negative impact on planned flow through the equipment and then through the rest of the plant. Three types of yield losses are now being tracked as part of a waste reduction initiative as well as part of the flow improvement project. Product rework losses have a triple impact on the business: material waste, unproductive machine time, and the cost of committing additional labor and machine time to rework the defects or sort good items from bad. Historically, the materials lost because of startups and setups were not captured despite the actual material waste being created. This type of material loss also contributed to inaccurate inventory downstream leading to additional small lot re-runs. Plant-floor employees and senior management, and all those in between, should be able to understand the impact of equipment related losses that have a direct line-of-sight to business goals and objectives. Tracking equipment effectiveness losses and then focusing on eliminating the impact of the critical few losses depends on a collaborative effort that begins with the equipment operators. Engaging equipment operators and the operations leadership team as part of the loss elimination efforts is not only an essential component of TPM but a vital element of any reliability improvement initiative. Robert Williamson Strategic Work Systems, Inc.